One of my favorite things about following blogs over the years is watching grass roots movements spring up and grow. Scary Mommy Thanksgiving Project, is really special. It started three years ago when a handful of mothers confessed that they could not afford food, let alone a special meal for the holiday. And a bunch of readers pitched in and helped them. Now, Scary Mommy Nation is a fully-fledged organization where over 2700 families received help last year. You can participate. If you need help, complete an application by November 1st. If you’re able to give help–large or small–please donate what you can (it’s tax-deductible). 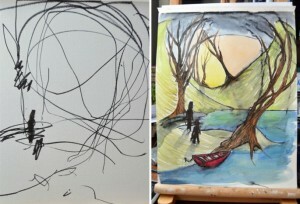 A mom out there is taking her 2-year-old daughter’s ink drawings and doing watercolors over them to create amazing masterpieces. I just love it. Head to Ruth Oosterman’s blog to see their amazing work (she has time lapse videos of each one coming to life). Did I say that? That’s also making me happy. The past two weekends had dreadfully long 6-8 hour days in overcrowded rec centers, for less than two minutes total of swimming. It was rough. Especially the getting up at 4:45am and driving in the dark and rain. Shudder. I hope you have some family fun planned for the weekend. We are finishing up our homemade Halloween costumes (here’s a sneak peek), doing the usual house chores (boo! ), and spending family time together instead of going in different directions. It’s all good.